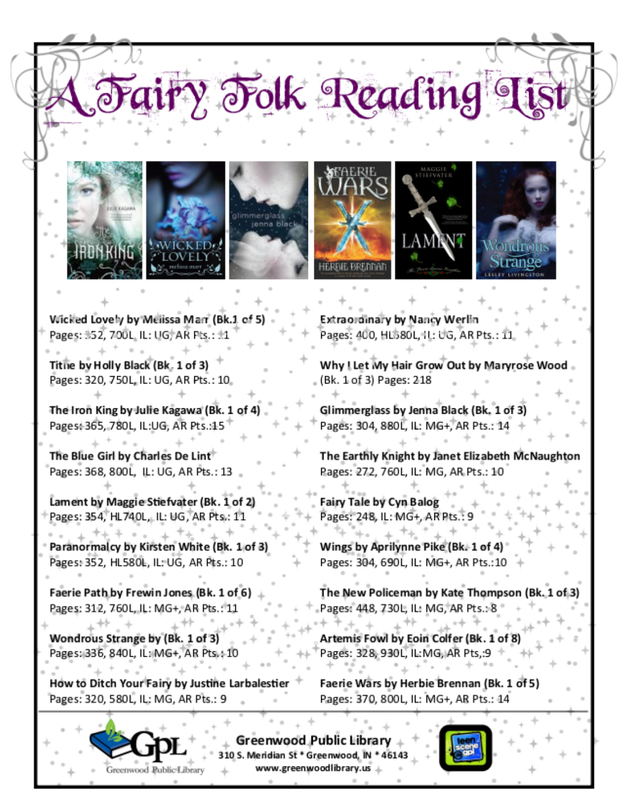 As I mentioned earlier this week in my Top 10 Tuesday, I'm a fan of fairies. I'm especially fond of the dark and mean fairies that are more than slightly threatening and are out for blood. While dancing and prancing in the sun would be nice, I'd so much rather be a part of the Winter Court if Queen Mab would have me. 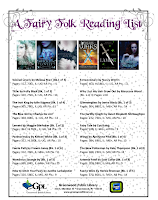 So here's a reading list of the Fair Folk. Here's a to link to the handout! If you would like a copy without our logo below, just let me know! Seventeen-year-old Aislinn, who has the rare ability to see faeries, is drawn against her will into a centuries-old battle between the Summer King and Winter Queen, and the survival of her life, her love, and summer all hang in the balance. On the day of an important music competition, talented but painfully introverted and nervous Deirdre Monaghan is helped to perform by the compelling and enigmatic Luke Dillon and finds herself inexorably drawn into the mysteries and dangers of the faerieworld. Evie, the only known human with the ability to see through supernatural "glamours," works for the International Paranormal Containment Agency (IPCA) tracking down dangerous creatures. (Really, she finds the work dull and would rather be shopping, watching TV, or at the very least at home painting her weapons pink.) But when a mysterious shape-shifter invades the IPCA and brings news of a string of paranormal murders, things start to heat up. Anita, an ordinary sixteen-year-old girl, is transported from modern-day London to the realm of Faerie where she discovers that she is Princess Tania, the long-lost daughter of King Oberon and Queen Titania. When seventeen-year-old actress Kelley Winslow meets Sonny Flannery, she discovers he is a changeling who guards the gate between the faerie Otherworld and the mortal realm, and also that her mother had otherworldly powers that she has passed on to Kelley. Phoebe, a member of the wealthy Rothschilds family, befriends Mallory, an awkward new girl in school, and the two become as close as sisters, but Phoebe does not know that Mallory is a faerie, sent to the human world to trap the ordinary human girl into fulfilling a promise made by her ancestor Mayer to the queen of the faeries. Dana Hathaway runs away from her alcoholic mother in order to find her father in Avalon and discovers she is a Faeriewalker, someone who can travel between both worlds. The plot contains mild profanity and sexual situations. In 1162 in Scotland, sixteen-year-old Jenny Avenel falls in love with the mysterious Tam Lin while being courted by the king's brother and must navigate the tides of tradition and the power of ancient magic to define her own destiny. Morgan Sparks and her boyfriend Cam have been best friends since they were children, but just before their shared sixteenth birthday Cam confesses that he is a fairy who was switched at birth with a human child, and now the fairies want to switch them back. When a plant blooms out of fifteen-year-old Laurel's back, it leads her to discover the fact that she is a faerie and that she has a crucial role to play in keeping the world safe from the encroaching enemy trolls. Child prodigy plus criminal mastermind mixed with a little greed equals Artemis Fowl. Determined to rebuild his family’s fortune, Artemis kidnaps a fairy police which sets him on a multi-adventure ladled journey into the Fairy World.